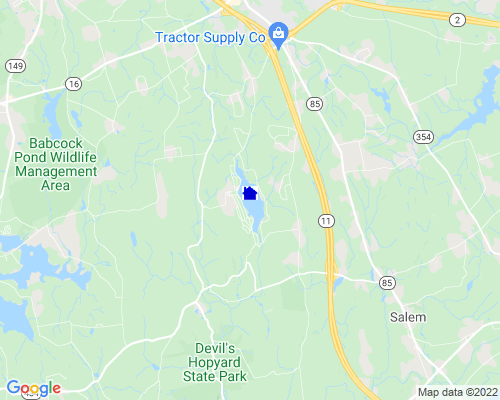 Lake Hayward, once known as Long Pond (by the Indian tribes who inhabited its shores) and then Shaw Lake, is situated just north of Devil's Hopyard State Park in the northeastern corner of East Haddam and is bordered by the towns of Colchester and Salem. In 1924, Mr. Goodyear, of the Goodyear Rubber Company, and Nathaniel Hayward were partners in a rubber mill which operated on the lake. Mr. Hayward remained in Colchester, CT when their partnership dissolved, and Mr. Goodyear traveled to Chicago with his Rubber Company. After Nathaniel Hayward's death, the Hayward Fire Co., Hayward Avenue, and Lake Hayward were named in his honor. The eastern shore of Lake Hayward boasts beautiful sunsets and a dirt road that is now a designated scenic route. East side residents are not part of an association since all the residents have either waterfront properties or a right-of-way for lake access. A state owned boat launch is located at the northern section of the east side. Facilities include a small paved ramp, parking for approximately 5 cars and chemical toilets (seasonal). This ramp is used for launching of small boats. Public access is restricted to the launch area. The west side of the lake, which enjoys wonderful sunrises, has four beaches all covered with clean abundant sand to entice the summer residents. The Property Owners Association of Lake Hayward (POALH) is a chartered body democratically governed by the property owners. Annual dues are assessed each year at the annual association meeting and the town assessment is used as a base. Through mandatory membership, owners enjoy the benefits of well-kept beaches, tennis courts, volleyball, basketball and baseball fields, areas to keep boats, a children's playground, garbage pickup, portalets at the beaches and a pavilion which houses many activities. Most of these fun events are made possible through the support of members of POALH, who voluntarily devote their time and energy. Among other programs, members enjoy potluck suppers, bingo, dances, arts and crafts and Lake Hayward Days. Lake Hayward Days started in 1930 when Mr. Bassett, an agent for Jas J. Smith Company (the company that developed Lake Hayward as a seasonal community), along with Mr. Grant, Thomas Phillips, Chick Anderson, Ev Johnson and Bob White came up with an idea, and the first "Lake Hayward Days" became an annual tradition. Swimming races were held early in the morning and continued for a good part of the day before the decorated boat contest, kiddy parade, canoe tipping/racing and watermelon fights were held. Our well-known Little Miss Lake Hayward contest, beach carnival and kid/adult games didn't start until much later. To add to the serenity of Lake Hayward, many years ago gasoline motorboats were banned, and now one can hear only the hum of little electric motors among the chirping of the Lake's peep frogs. During the summer months many enjoy swimming, fishing, kayaking, canoeing, paddle boating, row boating, and sailing, both in sailboats and on sailboards. During the winter months you will see ice fisherman and ice skaters on the lake with an occasional small fire for winter warmth. The blend of year-round and summer residences work together, and pride is apparent in the well-maintained properties displayed by the vast majority of seasonal (and year-round) residents. With today's zoning regulations, year-round residences are grandfathered in, but any new seasonal conversion to year-round must be on a minimum of a one-half acre lot. This regulation assures that Lake Hayward will remain a predominately seasonal area. Most year-round residents enjoy the busy summer season when friendships are renewed and summer activities begin. They do, however, also admit to enjoying the end of a season - when traffic diminishes, beaches become empty, kayaks, canoes and sailboats vanish for the winter and daily life becomes just a touch less social. "Every man or woman should own some real estate - they should have a place to call their own, where they can spend their summers and pass the days of their vacation to suit themselves, where the children can be taken early and brought back late, brown as berries, and with the robust health that only life in the open can give. No one knows what the future may bring forth. It is such a short drive from your home that you need not go away for an expensive vacation. Stay at home - take day trips to the Lake. Real Estate is an imperishable asset ever increasing in value. It is the most solid security that human integrity has devised. In fact it is the basis of all wealth." Lake Hayward is truly a place "where life meets vacation."